That's exactly what this gift basket is. 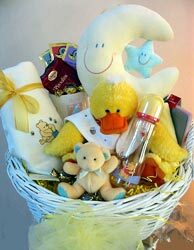 With a deluxe blanket, Russ Bear Rattle, Russ Plush Mobile, Duck, Picture Frame, Bib, Bottle, it is a must have for new parents. We have included New Mom Mug for Mom, and a few sweets, coffee and teas for Mom and Dad to share. Our large version contains bath products. Shown at $109.